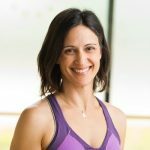 Julie is a physical therapist and one of our STOTT PILATES certified trainers. Julie has worked with everyone from people with chronic pain who want to return to an exercise routine to high-level athletes with acute injuries. She specializes in rehabilitation and enjoys working with clients who need help achieving their goals, or those who are still in pain despite trying traditional rehabilitation methods. Julie has a Bachelor of Science from Michigan State University and a Doctorate in Physical Therapy from the University of Puget Sound. She is a qualified Physical Therapist and Orthopedic Specialist as well as being a STOTT PILATES certified trainer. Julie has worked as a Physical Therapist in an outpatient setting since 2007. She decided to pursue STOTT PILATES certification when she integrated it into her treatment and noticed her patients were enjoying faster pain relief results. Julie loves working with clients after they’ve been discharged from the clinic as this allows her to work with the whole body. When she’s not helping others achieve wellness Julie can be found hiking, running, cycling, skiing and gardening. She also loves traveling and having fun with her husband and two baby girls.